If you experience frequent pain along your jaw, near your ear or in the muscles along the side of your face, which may be accompanied by popping, clicking or restricted movement, you may be the victim of TMD, which stands for temporomandibular disorder. While some people mistake this condition for TMJ, which is actually a joint of the jaw, it isn’t exactly the same thing. TMD actually describes a category of conditions that cause pain and dysfunction in the TMJ joint, as well as the surrounding muscles. In many cases, it can be difficult to identify the exact cause, but most cases of TMD resolve on their own with the help of conservative remedies that can be used at home. In fact, it’s best to try these methods before resorting to irreversible treatments, such as surgery or bridgework. You have two TMJs that connect the mandible, or lower jaw, to the temporal bone on either side of your head. These joints are quite complex and can allow for three-dimensional movement. The joint is made up of a ball and socket, along with cushioning disks. Large muscles located in the cheeks and temples allow for movement. The source of your TMD problem could be any one or combination of these parts. For this reason, it’s important to seek the help of an experienced dental professional if you experience any pain or have difficulty moving your jaw so they can recommend the appropriate course of treatment. The TMJ, like other joints in your body can become affected by orthopedic problems, such as sore muscles, disk problems, inflammation and strained tendons and ligaments. 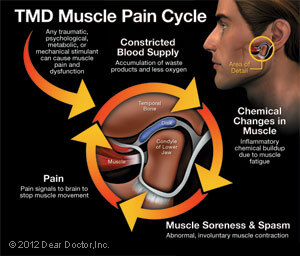 The impact of TMD can also be dictated by genetics, age and even gender, with women being more susceptible. Psychological and physical stress can also have an impact. For some people, this pain may be the result of other, more serious medical conditions, including fibromyalgia, which causes severe muscle pain. A Clicking Sound – Some individuals report hearing a popping, grating or clicking sound when they open or close their mouth. 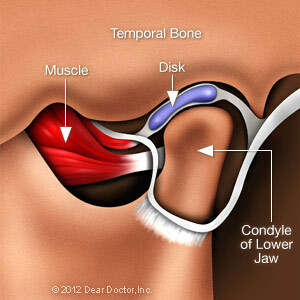 This is typically caused by the disk within the TMJ is shifting. In some cases, others can also hear this noise. While clicking isn’t a significant system itself because about one third of people do experience this type of sound, if the noise is paired with limited function or pain, such as the jaw sticking open or closed, it could be a sign of TMD. Muscle Pain – This pain is often felt in the temples, as well as the cheek, where the temporalis and masseter muscles are located. Many patients with TMD suffer from soreness and stiffness first thing in the morning, which can be related to grinding teeth or clenching the jaw at night. Using a custom-made mouthguard designed for sleeping can decrease the amount of force applied, which allows the muscles to relax and relieves pressure. Other remedies will be discussed under the Pain Relief section below. Joint Pain – In general, pain that exists in one or both jaw joints can be classified as arthritis, which is an inflammation of the joints. X-rays can provide insight into whether an individual has arthritis of the TMJ without pain or dysfunction. However, other individuals experience pain and dysfunction without the physical appearance of arthritis. While there is no cure for arthritis, medication may provide relief from symptoms. After an examination, we will help create a treatment plan that corrects the condition and managers any pain. You may need to make temporary changes, such as eating a softer diet, to reduce strain. Ice and moist heat can also be used to alleviate inflammation and soreness. Gentle stretching exercises can also help prevent muscle spasms. Finally, we may prescribe non-steroidal anti-inflammatory or muscle relaxant medications. In addition to pain relief, more severe cases of TMD may require other complex treatments, such as dental restorations like bridgework, orthodontics or even minor procedures to assist the joint, such as flushing the joint or cortisone injections. It is uncommon for patients to require major surgery. For many patients, it’s important to try as many conservative, reversible treatments and give t hem enough time to be effective before trying irreversible treatments. After an examination at the dental office, you can gain a full understanding of the right treatment options. 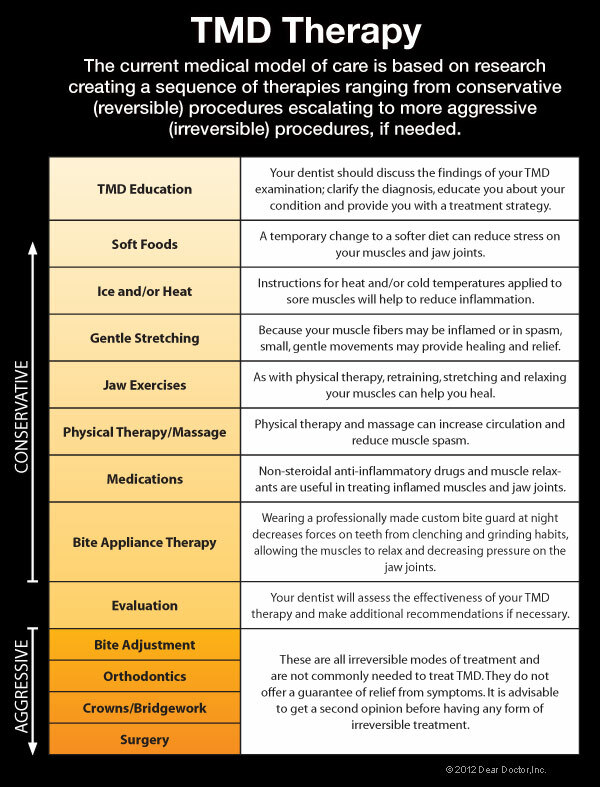 View your options with our Chart on TMD Therapy.